Reciprocal reading helps children understand what they are reading. It develops a genuine love and passion for reading. It allows children to access texts that they may not be able to decode yet. Reciprocal reading is something that is used to support children in understanding that there are more ways to read other than just phonics. In Year 1 and Reception we found children were very focused on decoding and often did not use a range of reading strategies. Phonics is important for helping children develop reading skills but cannot be taught on its own. Inferences: An example of an inference is: I think it will rain because the sky is grey. Comprehension monitoring: Using the pictures to check I am understanding what is happening. (e.g. I know the boy is in a town because there are houses). General Knowledge: Using what I know about the world to help me understand a book or picture (e.g. I think they will learn in school because that is what I do). Prediction: An example of a prediction is: I think this will happen next because. Retrieval: I can get information off a page (using the pictures to help me (e.g. There are 8 people on the page). 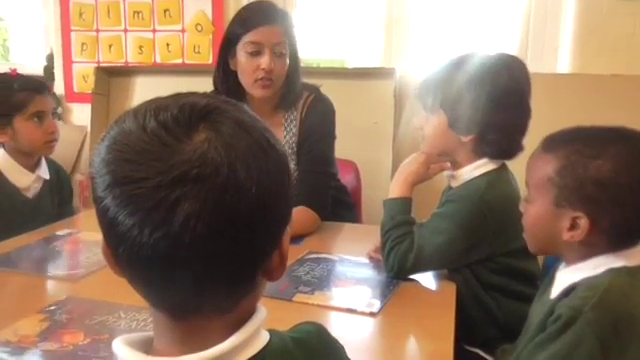 This is Miss Patel engaging in a reciprocal reading session with some Reception children. Notice how engaged the children are and all of the reading skills they are practising when they do not have to focus on the decoding. This story is all about sharing which you will find out. If you had one bit of cake would you share them? If you would who would you share them with? Draw a picture and write a sentence giving a reason why you would share it with this person. Draw a picture of a time that you have felt sad and write what made you happy again. Make a checklist of what you would take with you to the moon. You can even download and print the one we have used in class if you want. Remember to use capital letters for every new thing on your list!